A couple and their young child have "amazingly" survived being run over by a train on the London Underground. 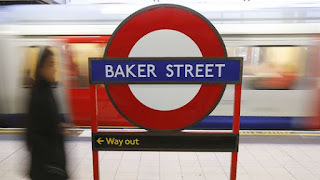 The unnamed mother was pushing her child in a buggy while looking up at an information board above the platform at Baker Street station on Friday evening. But she did not realise how close she was to the platform edge, British Transport Police (BTP) said. The buggy wheels went off the edge - and she, the buggy and the child fell on to the track. The child's father immediately jumped down to help them, but a train was on the way and they dived for cover. BTP said: "When they saw a train coming, all three were extremely fortunate in being able to move into a pit under the track and the train passed safely over the top of them. "Amazingly none of them were seriously hurt, but as a precaution they were taken to hospital for check-ups."